I spent a good chunk of today in the company of Canon and many of the businesses in what has become a large and successful eco-system around their photography and video products. They took over the business design centre for two days, filling the exhibition space with dozens of exhibitors, as well as their own stands, and a steady stream of seminars in the rooms upstairs. Good news for Canon 5D Mark II users in Europe – it sounds like we can expect a firmware update in the new year to give us 24p & 25p frame rates. If that means something to you, you’re probably dancing in your seat. If it doesn’t, just take it that it is good news and will be something to look forward to early in 2010. 1D Mark IV. The 1D keeps its crown. The body feels a little vintage – surprised not to see more new buttons on it – but the innards have been bought bang up to date. It now has video, catching up and overtaking it’s siblings. Hold down the shutter button for machine gun sound effects (10 frames per second), and it would probably lock focus on a speeding bullet too (45-point AF system). It’s definitely not cheap, but it really is top of the range and top of the technology curve. Should be hitting the shops in December. 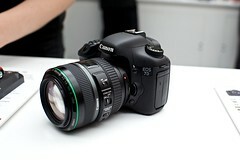 Canon 7D. Want one. That’s all. Yes, it’s a crop sensor, but if you are doing both photography and video, as I increasingly am these days, then the simple switch to toggle between the two modes, together with the start/stop buttom and the ability to shoot 720p as well as 1080p, make it a joy to use. The focus functionality felt better than the 5D mark II as well (as it should from the spec sheet – 19-point cross-type sensors). Oh, and 8 frames per second shooting. Nice. It isn’t going to display by 5D Mark II, but would be a really nice back up, given the built in flash and built in speedlight controller. The surprise of the show for me was the 70-300mm DO IS USM lens on the fellow in the shot of the 7D. It isn’t as big an aperture as I normally like (at f/4.5-5.6), but it is VERY compact for such a long zoom and great quality – I assume this is down to the DO (diffractive optics). 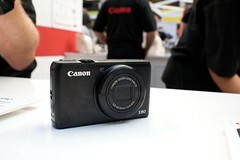 The new Canon Powershot S90 looks like a mighty fine product. Think every thing I said about the SX200is as a pocketable alternative to a DSLR (going without a DSLR), but a good few steps up. F/2 aperture (nice and wide :) ), 28mm wide angle lens with 3.8x zoom. Very compact, very easy to use with it’s function select and rotary dial around the lens, and a worthy pocketable alternative to a DSLR. This one is as perfectly matching as the convex mirrors for a car, giving exactly the vision you expect to get. Lots of steady-cam type set ups for the EOS DSLRs on show, and a veritable see of LED based lighting that was low heat, low power and VERY bright. But I’ll tell you about that in the next post… In the mean-time, a massive thank you to the Canon team for being wonderfully welcoming and helpful, and to the 1000heads team for being the social media stars that they are! 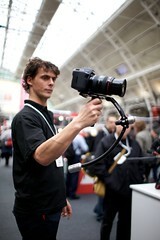 ← If you ever wondered how that freeze effect is done in The Matrix, check out this rig of Canon DSLRs. I played with the S90 at PhotoPlusExpo in NYC last week and loved it. It’s a great competitor to Panasonic’s DMC-LX3, and I hope the results match the expectations. 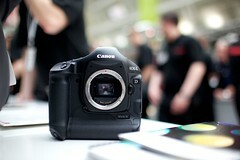 A good friend of mine has the 7D (bought it for the video more than stills) and is very pleased with it. Thanks Taylor – your world travel shots have given me a craving for a high quality pocketable camera. Good to hear the 7D is going down well. I guess with a 5D mk II and a 7D I could do two camera video shoots… Hmmm… (getting sucked into the video world).